"Yes, the Everglades is a swamp; so was Chicago sixty years ago." Napoleon Broward was born on a farm in Duval County on April 19, 1857. After losing both parents when he was twelve years old, he worked in a logging camp and as a farm hand, steamboat roustabout, steamboat pilot, and owner of a steam tug. In the mid-1890s, he used his sea tug, "Three Friends," to run arms out of Jacksonville to Cuban revolutionaries prior to the Spanish-American War of 1898. 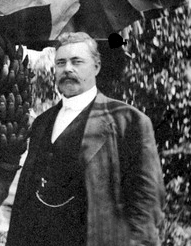 Broward was elected sheriff of Duval County in 1890 and served in other State political offices during the rest of his career. He served as nineteenth governor of Florida, serving from January 3, 1905 to January 5, 1909. He unified the state's institutions of higher learning under a board of control and was successful in draining and developing portions of the Everglades. Broward won the race for the U.S. Senate in 1910, but never took office. He died in Jacksonville on October 1, 1910 at the age of 53. The state named Broward County for him, memorializing his efforts to drain and channel the Everglades and for encouraging development in the region.